This project protected 56.3 acres of freshwater wetland and upland buffer along more than 2500 feet of Russell Brook, a tributary to the Crooked River. The project was part of the larger Crooked River Conservation Corridor project to permanently protect over 2000 acres and 9 miles of shoreline along the upper river in Waterford, Harrison and Otisfield. The Crooked River is a primary drinking water source, supplying 40% of Sebago Lake’s surface water, and is also the sole spawning ground for Sebago Lake’s famous Landlocked Atlantic Salmon. 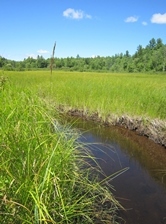 Salmon nursery habitat is present in Russell Brook as well, in addition to spawning and nursery habitat for wild brook trout. The project was supported by the Maine Department of Inland Fisheries and Wildlife.